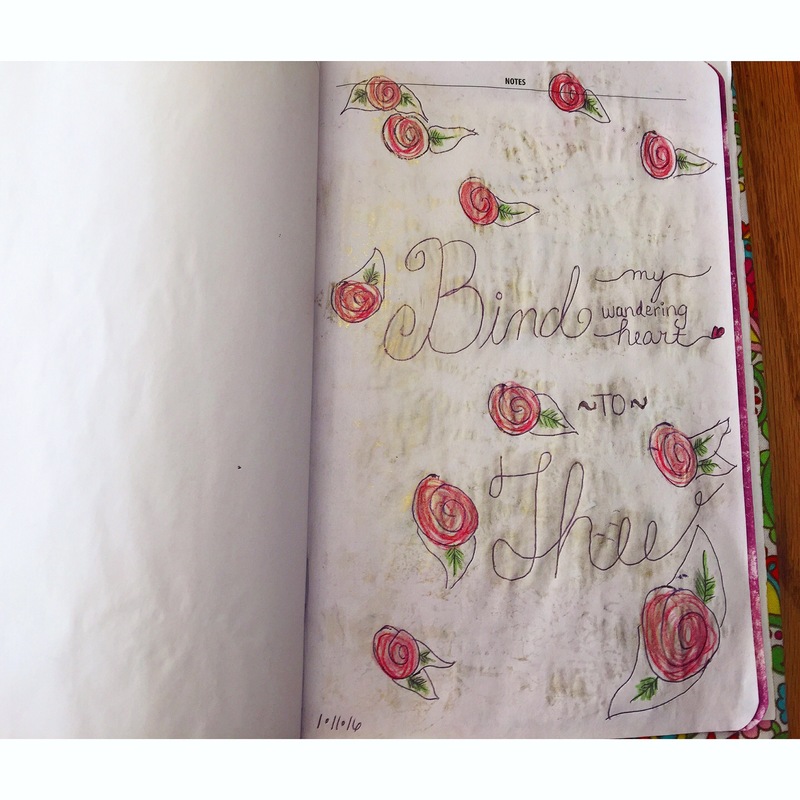 I just recently posted about How I Started Bible Journaling, so I thought for my next post I would show my first 10 illustrated pages in my Bible. I am currently reading through Genesis, as well as occasionally reading in Psalms and John, so that is where most of my pages are from. I already showed my first page in the previous post, so check it out to see it. Most of my pages are just colored pencil and pen, but I’ve been slowly adding some stamp ink in, as well as some alphabet stamps. The next thing I would like to try is watercolor, so that I can add even more color to my pages. Some of my inspiration comes from social media, and the rest is just my own doodling. I especially like words/lettering, flowers, and trailing vines. In fact most of the doodling found in my past journals contain one of these elements. I have several blank pages for “notes” in the back of this Bible that I use to experiment with new supplies, and I like to use song lyrics on these pages. It’s nice to have a place to try new things without worrying about ruining a page of Bible text, because my goal is to still be able to read the words and not completely cover them with art. I am excited to see my illustrating improving and developing the more I practice, as well as my confidence and creativity growing. I just have to say that this experience so far has been an example of growth for me, because this is the most open and public I have ever been with my journaling and personal devotion methods. I am usually a very private person when it comes to my journals, so this has taken me out of my comfort zone. However, it has also helped me to be passionate again about spending time in prayer and God’s word, so I am happy for the change taking place, and I hope that I can encourage others through my openness to be open too and express their faith in new creative ways. LOVE! LOVE! LOVE! This is the type of journaling I believe I can do. Thank you so much for sharing these pictures. You have greatly encouraged me!! passages speake to you, hope you will continue to do this, God Bless.